Explosions caused by ignited coal dust might be the most pressing safety concern for the modern mining industry, but mine operators also have to consider other risks to their workers and infrastructure. Seismic activity can impact underground mining operations and the associated surface infrastructure in several ways, from the damage caused by naturally occurring earthquakes to rockbursts, the explosive fracturing of rock in a mine shaft that may be caused by natural or induced seismicity. As mine operations become ever larger and explore ever deeper, the risk of seismic activity to related infrastructure increases. Despite the serious dangers, the majority of mining operations, even in seismically active regions, take few precautions to mitigate the risk or monitor seismic activity. Although mine operators could be forgiven for assuming that earthquakes and similar natural events represent a risk that is impossible to predict or guard against, options exist and are being implemented in other industries. Chris Lo talks to Weir-Jones Group founder and president Iain Weir-Jones about the risks posed by seismic activity to mines, and the potential benefits of installing earthquake early warning systems and microseismic monitoring systems, a practice that has so far seen little adoption by mining companies. Chris Lo: What kind of risk does seismic activity pose to mining operations? Iain Weir-Jones: Particularly in seismically active zones, as pit operations increase in size and depth, and the plants become ever larger, there is an increasing risk to the massive capital infrastructure that is associated with a modern, large mine. This is something that might have been tolerable with a small operation, but once you get into tens or hundreds of thousands of tonnes of production per day, you just can't afford this type of risk. The deeper you go, the vertical stress component, which is roughly one PSI per foot of cover, increases, and as the size of underground operations increases, the stress concentrations around the openings increase. We've seen this in South Africa, where in some cases mining has almost become impractical because of the ground control problem. 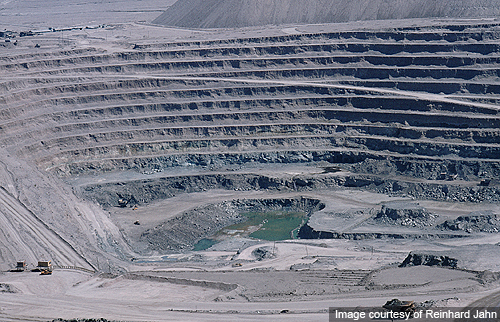 What are the basic safeguards that mines employ to monitor and protect against seismic activity? In terms of safeguards against earthquakes, there's very little. In my experience, in many countries in the mining industry, the effects of earthquakes have been largely ignored. Obviously, tailings dams should be designed to take into account the horizontal accelerations associated with seismic activity, and I think that's generally the case. But with equipment, much less so. For the majority of operations, or virtually all that we've seen in the last 30 years, the earthquake hazard is not something that is taken into account in the mineral processing end or in the design of overland conveyors. Are there things that could be done but aren't? I think it's the case that the earthquake hazard is known but ignored, from the point of view that, "Oh well, there's not a lot that can be done about it, if it happens it's a catastrophe". In fact, that's not really the case. We have shown that infrastructure in the civil sector can be protected by judiciously designed early warning systems. We've got a system protecting a major highway tunnel purely for that reason - there is a risk that was deemed sufficiently severe to warrant an early warning system being installed. Weir-Jones offers seismic monitoring systems - can you describe the core functions of these systems for the mining industry? Conventional seismic monitoring systems, the sort of things we put on large bridges, highway structures and buildings are generally intended to provide an assessment of structural integrity after the event. A seismic monitoring system is generally for post-processing. An earthquake early warning system looks at the environment around the facility continuously, and if it detects a P-wave, which is the more rapid seismic wave, that exceeds certain parameters, it then determines almost instantly that there will be a following S-wave, which is a much more damaging vibration that travels less rapidly. It then takes immediate action to initiate protective measures on the structure. It's an active, dynamic system that continuously monitors the environment. Earthquake early warning systems provide vital seconds in the event of an earthquake, giving operators time to shut down vital machinery. With an early warning system, depending on where the epicenter is, you can get a 10-40 second warning of an impending major earthquake, which gives you time to shut down critical equipment in the mill. This mitigates the damage that would occur to equipment that's still operating. That's the important factor about an early warning system - it gives you a grace period in which you can implement protective measures. What's the level of uptake for these kinds of systems in the mining industry? To the best of our knowledge, virtually no mines take this precaution. 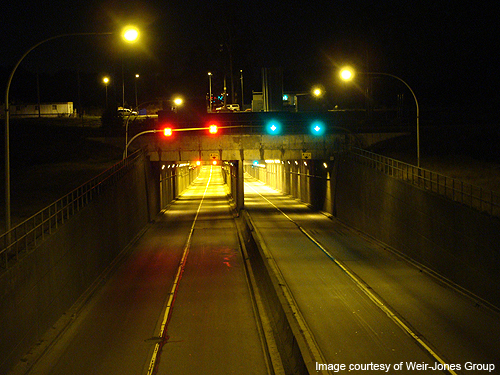 It's only about three years since we implemented a practical system on a tunnel for the [Canadian] Department of Transportation. It's something that we believe should be part and parcel of a protection system at a mine in an earthquake zone. Could these systems encourage better practices and reduce instances of induced seismicity and rockbursts? They could, but remember the energy release for the most part in a rockburst is relatively small. This doesn't mean that you're not going to cause a drift or a stope to collapse, with resultant fatalities. But the energy released is generally very small, relative to the energy released by an earthquake. The majority of rockbursts are a pillar failing or the ground around a drift failing because of excessively high stresses, either induced or natural. They produce a sharp, sudden release of energy, which destroys the workings in the immediate area but by the time they reach the surface, they're largely attenuated. Is there the potential for monitoring systems to sense problems that could lead to a rockburst? Now you're moving into the area of microseismic monitoring. Yes, we have other systems where the levels of energy they pick up are much smaller. We make microseismic monitoring systems that listen to the events that are induced around a mining operation, or around a civil engineering excavation, and give warnings of increased activity that may lead to a catastrophic rockburst. They also, if there are enough small events, dissipate the energy and there may not be a major burst, just a lot of strain relief. If you're underground in a drift in a seismically active area, you will hear snapping or other little noises in the ground, which are just the natural release of strain energy caused by slippage on faults or around the disturbed zone in a drift. Those are the natural dissipation of the energy concentrations. They are, in effect, tiny little rockbursts - they don't cause any damage, they're just the noise associated with the ground trying to regain equilibrium, in terms of the state of stress. It's when those little events are impeded and the strain levels build up to the point that when they do move to the point of equilibrium, they release a lot of energy, and that's the damaging rockburst that closes a drift. 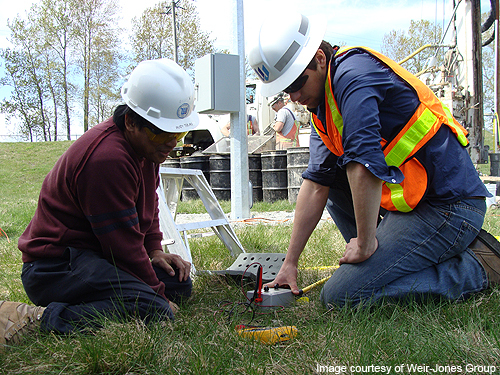 Microseismic systems can monitor those noises and give warning when the strain levels could be getting too high. What you do then, and this is done by us and the South Africans do this, you put in arrays of geophones around your mining operation, the geophones listen to the P and S arrivals from the naturally occurring rockbursts. You determine where the highly stressed zones are in the hanging wall or in the pillars, and from that you predict either where a burst may occur, or you provide instructions to the operators on where they have to de-stress. Is there any regulatory framework for including these systems in mining operations in the US and Canada? Not directly monitoring, but there is obviously a responsibility to maintain a safe working environment and to mitigate hazards. As mines go deeper, do you think regulations will have to catch up in terms of having more direct seismic monitoring requirements? That's true, and that's the route it's gone in South Africa, and remember the South African mines are deeper than any we have in North America by 4,000-5,000ft. Also, in different areas you see different tectonic stress fields. If you're in a highly stressed environment, the need will develop at an earlier stage. There are lots of operations where, either because of the mining method or the natural state of stress in the ground, you can have induced rockbursts at much shallower depths. The Coeur d'Alene in Idaho is an area where rockbursts have occurred for many years at much shallower depths.